I am taking my Jasper Fforde books very, very slowly. I read The Eyre Affair last January, then Lost in a Good Book last summer. It’s about time to read the next one. This way, they will hopefully last me a few years. Can’t wait to get myhands on this one! Oh, so glad to hear it’s a wonderful book! I have been excited about this book since I first heard of it and I think it will be nice to see Fforde tackle a new type of writing. I love the Thursday Next books and think that they are some of the most fun meta-books that I have ever come across, but I am also anxious to see Fforde spread his wings with something new as well. So, so glad you loved this book…it’s moving up a few spots in the wish list. Awesome review, going to check out your BookPage review now! As I think you know, I was not as enamored of the Thursday Next books as I expected to be, but Cara over at Ooh Books just about convinced me this weekend that Shades of Grey might be a better match for me. Now you’ve added another mark to the “yes I should try Fforde again” column. I enjoyed The Eyre Affair, but haven’t read any of his others yet. I’m sure I’ll get round to this one day, but I think I’ll start with the pile of his books I already own! @ zibilee: I think the best way to sum up this book is a quote that will likely feature in my upcoming interview: It’s not Thursday, but it’s definitely a Jasper book. Without an author page, you’d still know this was Jasper Ffore, it’s just him doing something new and exciting, and not borrowing from the cannon! It’s great stuff, really provocative, and of course full of the humor we’ve come to love and expect from him! @ Teresa: I was thinking of you when I mentioned that Fforde skeptics might want to give this one a shot! 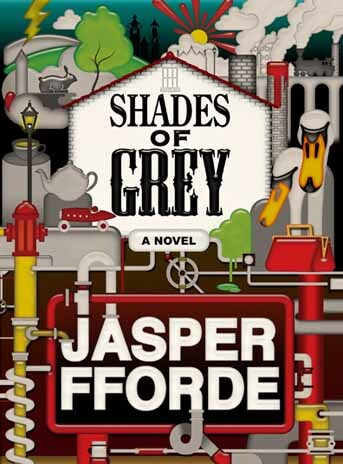 As I said, there’s no denying it’s Jasper Fforde, and you may still find it’s trying too hard to be clever, but I think because he’s starting from scratch here and drawing on his own resources that thins are a lot less tongue in cheek, which you may appreciate. @ Jackie: That seems completely reasonable! No sense rushing out and starting a new series when you still have one to make your way through! @ Sarah: Well, I have to say that Fforde apologist that I am, I wouldn’t blame you if The Big Over Easy (which is the one featuring Humpty) left you in a bit of a Ffore slump – it’s my least favorite book by him to date. I’m happy to report, however, that it was a blip since the next book in his nursery crime series is much better, and Shades of Grey is even better still! I am so very jealous of you that you’ve read this! I’m reading the latest installment of the Thursday Next series now and it’s everything I love about Jasper Fforde: fun, fun, and fun. I can’t wait to get my hands on this one. I’ll always be Thursday girl as well, but I’ll read anything Fforde writes. If nothing else, I know I’ll have a good time. @ J.S. : Over the past few years I have been slowly re-reading my way through the Thursday books, so I hope to read book 5 this year… all in preparation for Fforde’s next book which will be a Thursday book! I love that with Fforde he always manages to both surprise you AND give you exactly what you want. As a reader, it’s the best of both possible worlds! I loved this book and can’t wait for more in this new series! You’re right — plot-wise it takes a long time to get going, but this world is so wholly original I didn’t mind. I can’t wait for my copy of this to arrive (Tanabata in Japan received hers from the book depository today!) I think I mentioned to you that I received a sampler of the first two chapters from the publisher and I am already hooked! I love the Dystopian feel to it and the chromatic theme is already discombobulating! I agree that it is very different from the Thursday Next and Nursery Crimes series. @ Isabella: I went and read your review and I thought it was spot-on as well – the plot does get a bit unfocused at time, but for the first in a new series it is a strong “debut”. I’m glad to hear you enjoyed it so much! @ Claire: I hope your copy arrives soon (I can’t remember what the official release date was in the UK, but surely if someone in Japan has received it yours should be showing up soon, right? Let me know if it doesn’t and I’ll raise some heck!). I am confident you’re really going to like this one.